The October one-day theme on Sophistique Noir is lace. Many goth styles use lace, particularly in combination with dressy fabrics such as chiffon, satin or velvet. Using simple sewing patterns, you can make some beautiful additions to your gothy wardrobe. Here are some ideas. 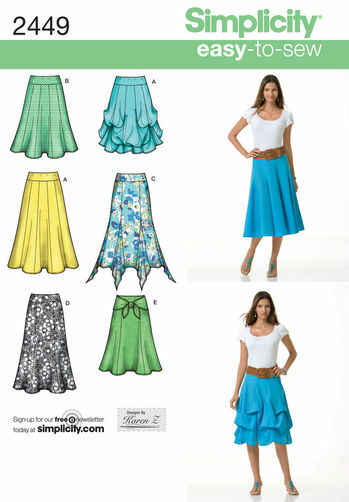 This is an easy pattern for short pull-on skirts. I used view B. The main skirt is made of panne velvet, with two overlays of batty lace. I think I'll also add gathered black lace to the hem. The lace is first shown on white so you can see the design. This one has a variety of shrugs, capelets and tops. I used view G to make a capelet of burgundy lace lined with black cotton. Poodle skirts?! When you look at sewing patterns, ignore the fabrics and colors shown; focus on the structure of the items. If you look past the pink and poodles, you'll see McCalls 5681 as a simple pull-on circle skirt. Made in lace, satin, or panne, a circle skirt looks great with a corset. And it's one of the fastest and easiest items you can sew. There are only two pattern pieces, three seams, and a hem. I used this pattern to make a lace skirt with a cotton waistband, leaving it unlined so I can layer it over various other skirts. The lace is first shown on white so you can see the design, which is spiderwebby with large-scale bats. This is one of my favorite patterns. I love the style of view B in particular. It's full and flowing, and with multiple panels, it can be made in complementary colors. I have at least six skirts made in view B. In this case, however, I used view E because I had only two yards of lace. The lace had scalloped edges, and I placed the pattern pieces so that the edges because the bottom of the skirt. The pattern does not have instructions for a lining/underskirt, but that's no problem. Just make two skirts - one lace, one satin - and stitch them both to the same waistband. Though this pattern is for a gorgeous floor-length gown, I used only the oversleeve pattern piece. I cut the sleeve out of lace and trimmed it with lace. Instead of attaching it to an upper sleeve and dress, I stitched it to a wide band of stretch velvet to make a... hmmm, I'm not sure what to call it. But repeat and you've got yourself a pair of lovely whatever-they-ares. ;-) I embellished them with a ribbon bow and a cameo (an earring in its former life). Thanks for sharing your handiwork, I love that capelet and the sleeve especially. I need to follow your example and use my sewing machine! Godness! You're a clever girl. I love every single thing you made!! Lovely pieces, and you have really creative uses for lace fabric. I really love the idea of a Gothic lace poodle skirt for some reason. Snowhyte - Thank you! The capelet was sort of a prototype. Successful, I think. I will definitely be using that pattern again. The capelet is fantastic and I love the way the spiderweb/bat lace looks over the burgundy satin circle skirt. Julianne - Thank you. I, too, love the lace over satin. I think I'll make a purple and a red satin skirt to layer it over. So many beautiful creations! You actually inspired me to dig back into my pattern stash and I started on a little capelet yesterday (mine will be totally amateur, but at least it'll be some practice!). You are brilliant to use the sleeves from that costume as stand-alone accessories. They came out gorgeous! I'm totally in love with the purple skirt with lace overlay too, of course (purple!!). Thank you so much for sharing these inspiring pieces for the Lace theme. The lace over the red skirt is fantastic, and the sleeves may have solved a Halloween costume problem I've been wrestling with. First my drapes, now my Halloween costume. You're just a treasure trove, aren't you? DeeSpookyOne - Absolutely. :) There are so many patterns available for $1 or $2, it doesn't make sense to pay more... at least in my frugal mind. Love your blog! Keep up the good work.